Photographs of two Air Koryo cargo planes landing at Moscow’s Sheremetyevo airport have confirmed that North Korea repainted civilian jets with temporary camouflage coloring for a high-profile “Victory Day” celebration in July. 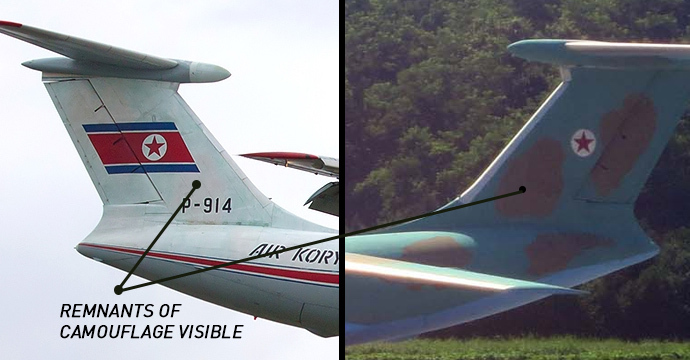 The pictures, published at RussianPlanes.net, prove that three “military” Ilyushin-76 cargo planes seen flying over Kim Il Sung square this July were borrowed from state airline Air Koryo and temporarily repainted in camouflage coloring – likely to exaggerate air force capabilities to watching international media. Close-up shots of the tail section of the Moscow-bound Air Koryo cargo planes show visible remnants of green and beige paintwork – the same coloring seen on the three “military” cargo planes involved in the July 27 “Victory Day” celebrations. “It’s certainly interesting seeing these aircraft abroad after seemingly being flown with military livery,” Lawrence Dermody, a researcher at the Stockholm International Peace Research Institute told NK News after seeing the pictures. 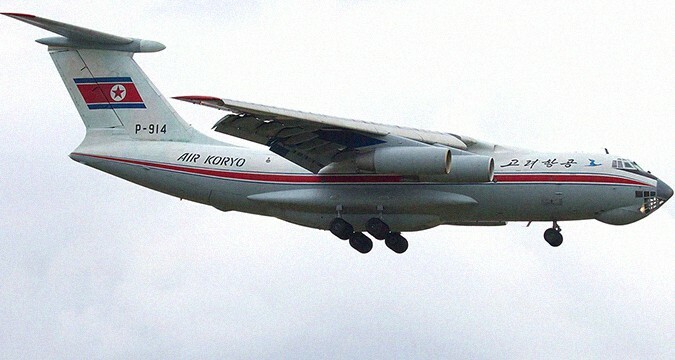 North Korea has previously used the IL-76 cargo plane to attempt to transfer arms, most notably in 2009 when an aircraft operated by Kazakh national Aleksandr Viktorovich Zykov was intercepted in Thailand, found to be carrying 35 tons of North Korean weapons for a client in Iran. However, it is not yet known why the two North Korean cargo planes were in Russian airspace when photographed in Moscow on October 5: Sheremetyevo International Airport is not a known IL-76 overhaul location and Air Koryo’s fleet does not undergo repair in Russia. 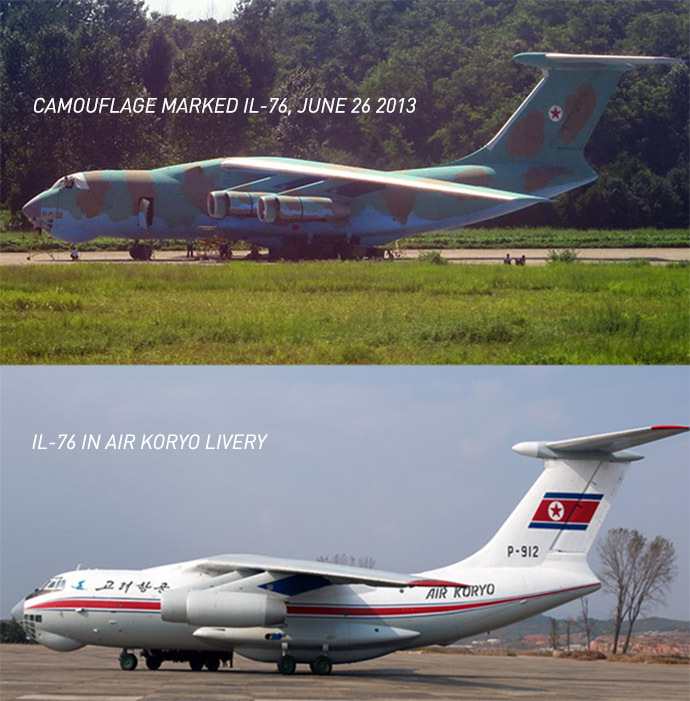 In August experts told NK News they believed the IL-76 aircraft had been temporarily repainted when a close-up photo of one of the camouflage variant cargo planes at Pyongyang’s Sunan airport emerged. “I think a more far-flug but reasonable explanation is that they used water-based (removable) paint, something that is common to do it in the film industry,” a source familiar with North Korea’s aircraft assets told NK News. In the film industry special water-resistant paint can be applied to aircraft or vehicles for temporary use. It can subsequently be removed by applying a dissolvant which – after scrubbing – will remove the surface layer of temporary paint. North Korea has a long history of displaying the very best of its military hardware at annual parades, often using the occasion to unveil new technology or acquisitions. But observers say that the country sometimes showcases dummy equipment at the event, specifically with the purpose of misleading foreign intelligence. “Nuclear backpacks” seen at recent “Victory Day” were suspected of being one such example of dummy technology. 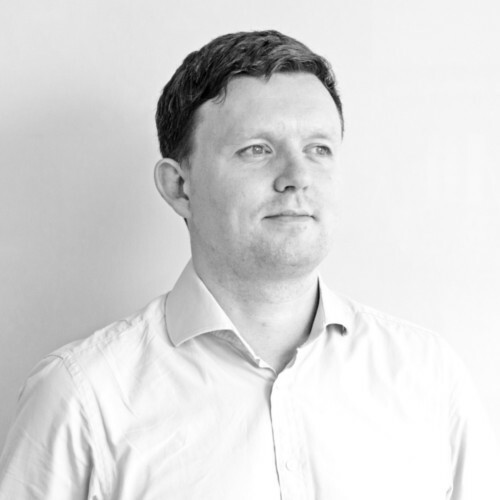 Subscribe to read the remaining 524 words of this article.